The LEGO Group today officially announced a new Harry Potter set! 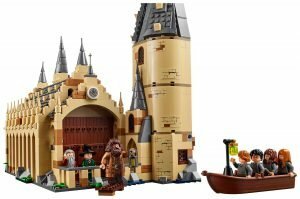 Hogwarts Great Hall will retail for just $100, making it “fairly affordable” for a lot of people, but it’s also only 878 pieces, so this is not the UCS scale one of rumors. This also supports the rumors of more Harry Potter and Fantastic Beasts sets this year. The new set features lots of dark stone grey and tan coloring instead of the sand-green of the previous set. There’s a lot of new elements or elements in new colors in this set. Take a look at the roof and you see new 1×1 triangle pieces, kind of like a double sided cheese-slope. There are also sand green ski poles on some towers, the new leaf piece and what looks like new microfigures. Hagrid is also holding a new lantern piece. Be sure to look at the images and click to enlarge for a lot of other details, especially in the 10 minifigures! Sadly, the brick pattern on the tower walls appear to be stickers. Also, I’m sure it’s for legal reasons, but why is the brick separator front and center in so many set pictures?